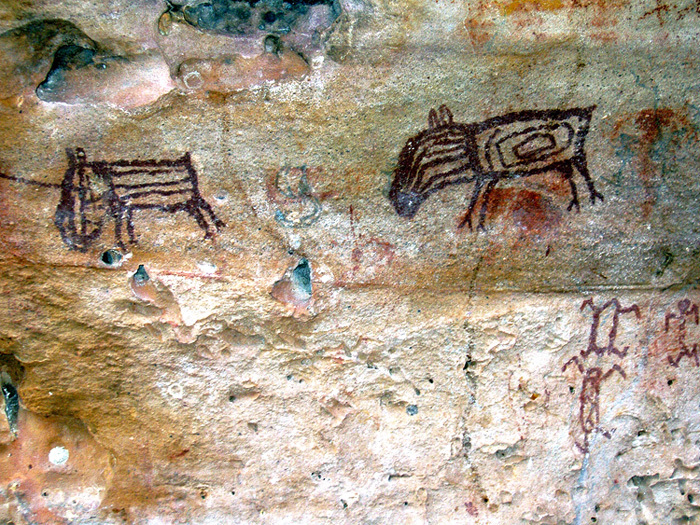 The rock art of the Serra da Capivara National Park in the north east of Brazil, with research led by archaeologist Niède Guidon, helped establish it as a World Heritage Site in 1991. 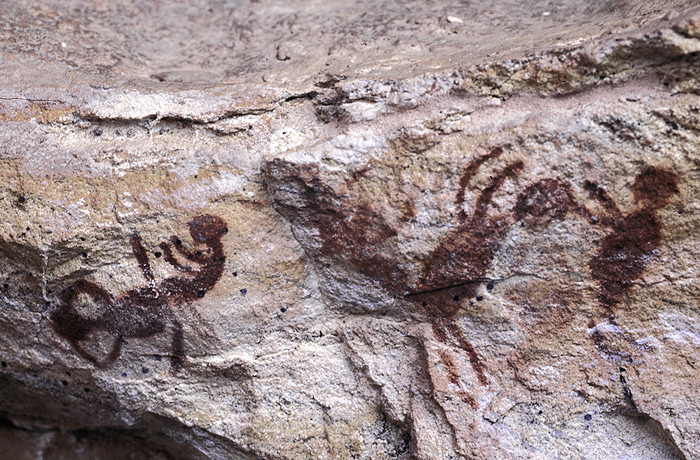 The best known archaeological site of Serra da Capivara is Pedra Furada, a rock art shelter with over 1,150 images and thousands of artifacts. 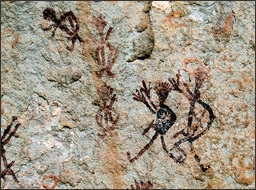 Her theories about the archaeology and the rock art are controversial, as she questions the putative dates for the relatively recent occupation of the Americas by anatomically modern humans, proposing a date in excess of 45,000 years ago, based on her archaeological research at the sites. 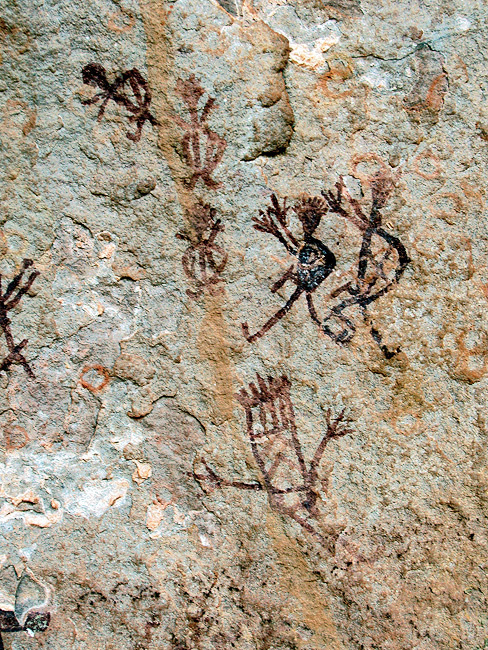 The rock art of Pedra Furada depicts the use of spearthrowers and and traps to hunt. 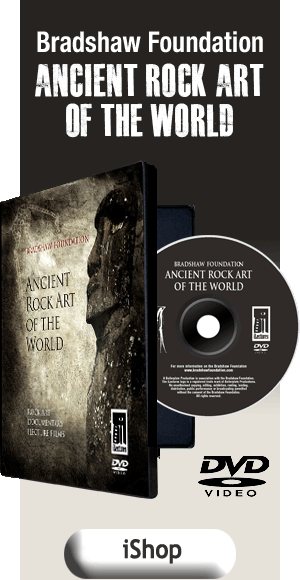 Archaeologists have found a lithic industry incorporating quartzite, flint, chalcedony, and quartz. 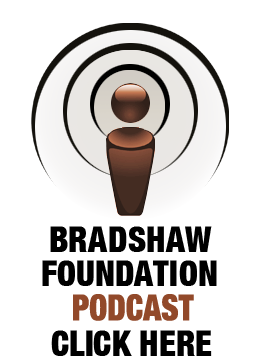 The number of types of tools is limited and their design is not overly elaborate. 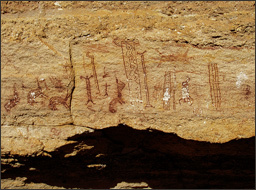 The paintings, termed 'Nordeste (Northeast) Tradition', date to approximately 12,000 years BP. 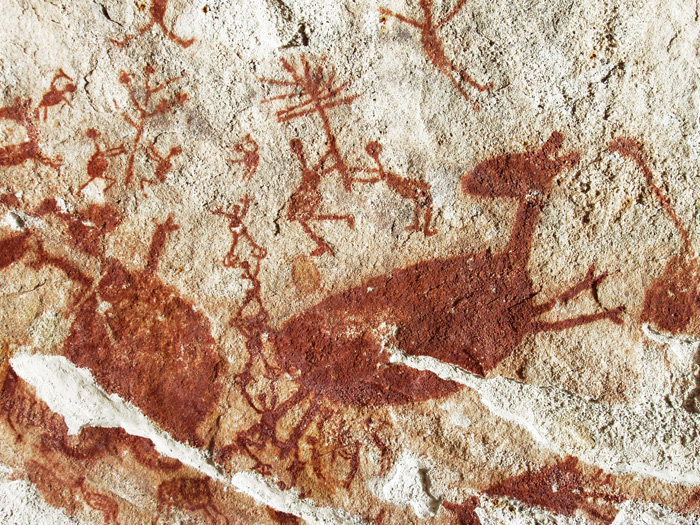 The main characteristic of the Nordeste Tradition are narrative figures representing actions of daily life (leisure activity - 'actions ludiques'), hunting and ceremonial events, as well as abstract and geometrical designs. 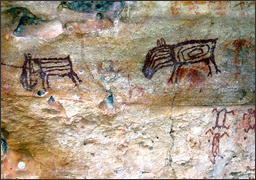 Guidon estimates that the Nordeste Tradition endured over 6,000 years, during which time the style evolved. 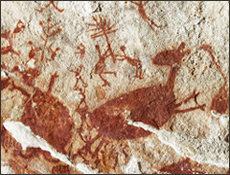 The painting techniques varied, from an early use of fingers to a more refined and intricate use of brushes made from animal fur and plant fibres. Indirect dating by associated stratigraphy at the Toca do Baixao do Perna shelter has been obtained from charcoal at the top of a hearth found in the sediment covering a fallen painted fragment, dated 9,650 +/- 100 BP, whilst charcoal at the bottom of the hearth 20 cm below, dated 10,530 +/- 110 BP [Guidon & Delibrias 1986]. 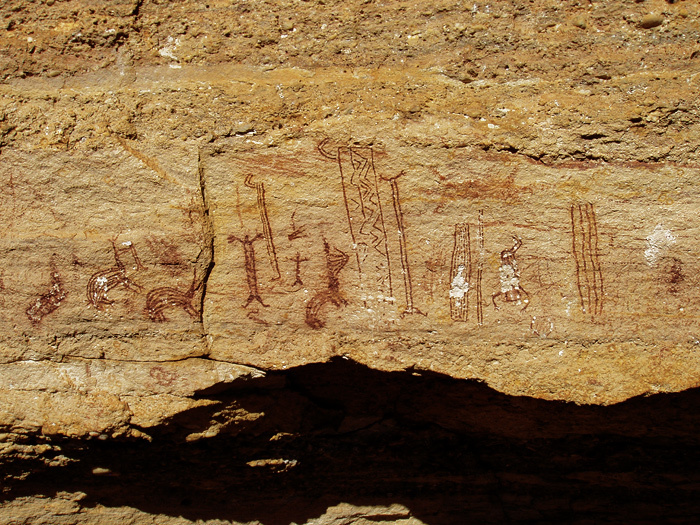 Excavations at the Toca do Boqueirao shelter yielded a rock fragment with red painted lines [uncharacteristic of the Nordeste Tradition]. 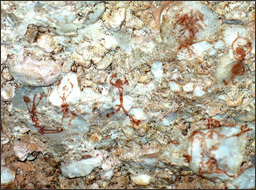 Charcoal from a hearth found in the same strata gave dates of 29,860 +/- 650 years BP (GIF 6651), which according to Guidon suggests that at least 29,000 years BP prehistoric people in this area prepared pigments. 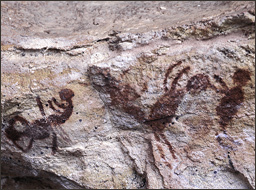 The pigments used in the rock art were prepared with locally sourced reddish ochre (iron oxide) and clay of different colours. 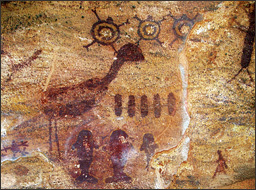 The ochre was the most used pigment, in various tones. 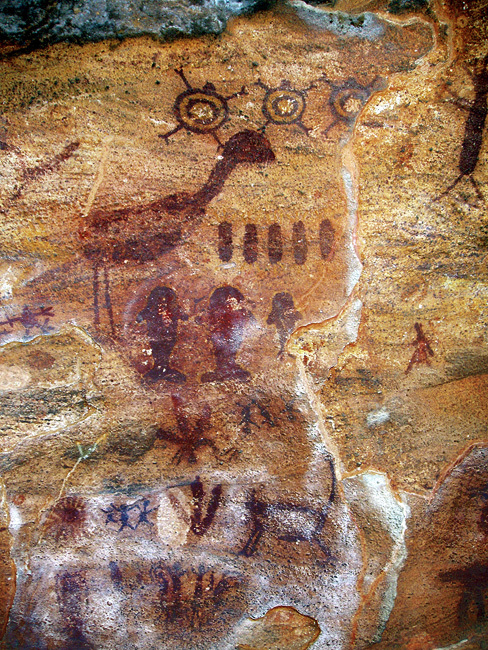 Other colours were also used, such as yellow, white, black (analysed as burned bones) and gray. The pigment’s exact consistency shows no sign of leaching. 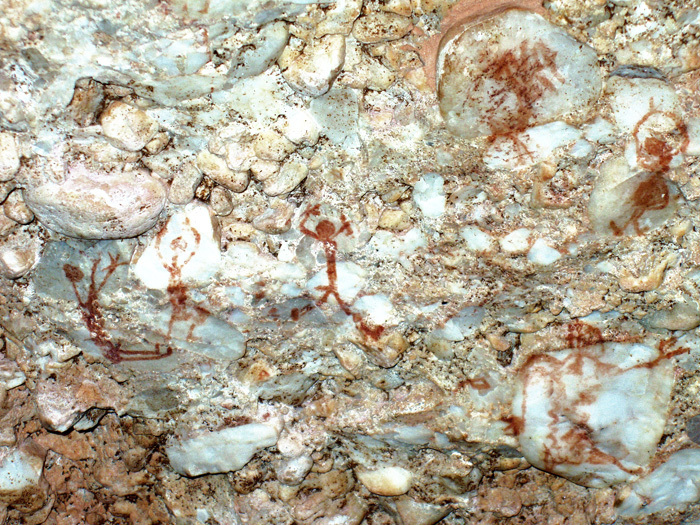 Pigment would have been prepared on site; excavations at the Toca do Sítio do Meio shelter uncovered a piece of pigment-stained sandstone with a central concavity used as a mixing palette. Associated charcoal was radiocarbon dated to 8,920 +/- 50 years BP.